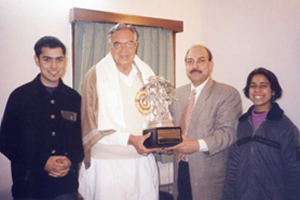 Leading publishing house—Krishna Prakashan Media (P) Ltd. was awarded with the world's prestigious award ‘Century International Quality Era Award’ for the year 2003. This award was given to Mr. S.K. 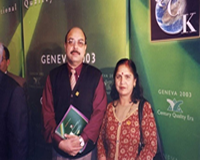 Rastogi, Chairman & Managing Director, Krishna Prakashan Media (P) Ltd., in the 5th International Quality Convention organized by Business Initiative Directions, an organization of Madrid (Spain) at Hotel Intercontinental at Geneva (Switzerland) on 5th of May, 2003. A few of the honourable citizens from more than 100 countries participated in this prestigious award ceremony. Quality related improvements in India are being viewed with great respect in the world. Speaking with his experiences, Mr. Rastogi said that we have a lot to learn from Western countries. He praised the working system, work culture, dedication and co-operation existing in Western countries. Being selected as the only publishing house from India as well as the world, Mr. S.K. Rastogi, Chairman & Managing Director of Krishna Prakashan Media (P) Ltd. was awarded by Mr. Jose. E. Prieto, President, Business Initiative Directions, Madrid (Spain). Mrs. Anita Rastogi, wife of Mr. S.K. Rastogi and Director, Krishna Prakashan Media (P) Ltd. was also present in the prestigious award ceremony. Krishna Prakashan Media (P) Ltd. was selected for QC 100 TQM (Total Quality Management) on the basis of online survey conducted in 165 countries all over the world. 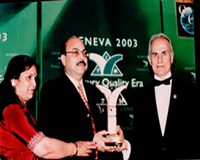 The Century International Quality Era Award recognizes the success of those companies who strive to improve company quality and who pledge to serve as an example within their business community. 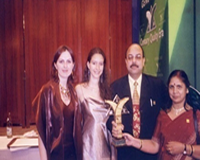 KRISHNA Group was honored with the "Distinguished Publisher's Award" for the year "2002". 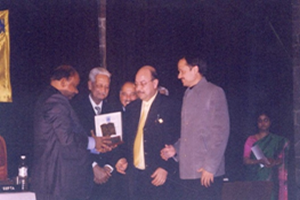 This award was conferred to Mr. S.K. Rastogi for excellence in Book Production, by the F.E.P.I. (Federation of Educational Publishers in India). This award has been considered a benchmark in assessing National Book Production Standards.